Are You In Tune With The Touring Mind of Solo Artists? What goes on inside the mind of a solo artist when they’re on stage? Do they struggle to connect with the crowd? Or is their show more personal and palpable? Is there something about the live music experience that convinces solo artists to tour when their heart and mind are divided? A few weeks back I spoke with Chicago-based cellist Alison Chesley (AKA Helen Money) before her show at the Empty Bottle. I was interviewing Chesley about her latest album In Tune and her experiences as a musician, composer, arranger and longtime member of the Chicago music community. Our complete conversation will be available in the forthcoming Alarm Magazine article later this year. But right now I want to share with you a couple moments from our chat mainly because Chesley talked about two crucial psychological and sociological elements of her live show. First, she took me inside her mind to explain what it’s like for her, as a solo artist, to perform and tour and how she maneuvers in her mind and connects with fans during the show. Then she explained what motivated her to tour when doubt loomed. This Empty Bottle show came at the end of Chesley’s recent fall tour in support of In Tune, so her touring experiences were fresh and ripe for reflection as we sat in the basement chillout room underneath the venue before her concert. For starters, you should know that, as Helen Money, Chesley plays the cello with the adventurous heart of a punk rocker. She can make her cello growl, snarl and roar, or sound as gentle as a kitten. Whatever sonic she’s aiming for, her main goal is to make the cello sound like anything but a cello. And she succeeds triumphantly! When she’s onstage you can’t help but feel drawn in and moved and even transported to a different and darker cerebral place that’s somehow both unsettling and healing. 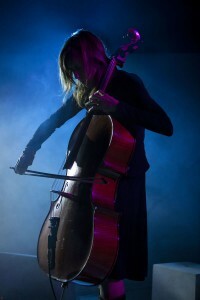 To put in another way, during a Helen Money concert you feel like you’re simultaneously experiencing an intensely beautiful cello performance and a gritty, aggressively brutal punk rock show. But at the time of our chat I had yet to see her perform live , so I wanted to know what goes on inside her mind and what it feels like to perform alone on stage. From playing the music to interacting with the crowd, each artist approaches their live show differently. And you never know if an artist feels happy to be flying solo or if they’re completely terrified of being the only one onstage. So I love how Chesley gives us a better understanding of the advantages and disadvantges and tell us what challenges she experiences when playing solo. Playing by themselves does give a solo artist more of an opportunity to experience deep connection with the crowd during the show. But, as Chesley explained, being a solo artist also presents a lot of challenges that go beyond just the performance. We don’t often think about it as fans, but being a solo artist can impact everything from the soundcheck to the dynamics of interacting with the other bands on the bill. So what about you? If you were an artist, would you play solo or travel with a band? Why Do Artists Really Need To Tour? Even in an age where a lot of artists depend on touring to pay the bills, you might think the choice to tour in an easy decision for an artist to make. But it’s not always as simple as that. When I asked Chesley how her recent tour was going she said she spent time to really think about her motivations and inspriations to tour. And what she shared with me also illustrated important truths about the live music experience. So much of the live music experience depends on that artist-to-fan connection that Chesley mentions. Many artists thrive on the connection they feel from the crowd and Chesley’s insight shows us that live music is not just an escape or just about the money. Many times the source of pleasure we feel during the live music experience derives from the strong connection with all have we each other during the show. It’s often hard to pinpoint the actual emotional source of any given concert because the connection we feel can come from the music or the collective response vibe from fellow fans around you. But one thing’s for sure, the live music experience demonstrates that as humans we all have a basic need to connect and feel connected to each other. And when we go to concerts where we feel that deeply personal or even spiritual connections, we should always remember that an important part of that connection lies at the crux of an artist’s decision to tour. And what amazed me about my pre-show chat with Chesley was that it was our basic human need for community and emotional interaction that lead her to perform even when she had her doubts. Did I Feel That Connection? Yes, I felt that connection that Chesley talked about. And without a doubt, knowing her thoughts on live performance and her doubts about touring made the show that much more powerful and compelling. And I can also say without a doubt that the source of what I felt came directly from Chesley’s music. From the first jagged, yet delicate, push and pull of her bow across the cello’s strings, the Empty Bottle erupted with reverberating ripples of power and strength. An undeniable force flowed through the venue. I felt a rushing through my heart and mind. Chesley’s performance was raw, naked and revealing. Together with the other fans I witnessed the truth of how a cello can rock, roar and growl gorgeously when it’s in the hands of Helen Money. Then, as I closed my eyes and just listened to her play, I could also feel the second layer of connection via the unseen but fully felt sentiment coming from the other fans around me. It goes without saying that I’m beyond glad she decided to tour because In Tune‘s songs would not have been complete without seeing her perform them live. And I’m sure other fans would unanimously concur. I wish I could provide videos of the Empty Bottle performance, but I can’t. However, Chesley has graciously provided two videos that I can share with you. I hope you enjoy them both and I’m sure the vidoes will give you a feel for what it’s like to see her live. But don’t stop with the videos. Use them as just a primer. Go see and fully experience Helen Money live for yourself and get more info here. And then come back and tell me what you feel. Do all artists feel that compelled to connect with fans? Do all artists hinge their decision to tour on the basic human need for connection?